Thank you for your support as I worked through this difficult family incident. 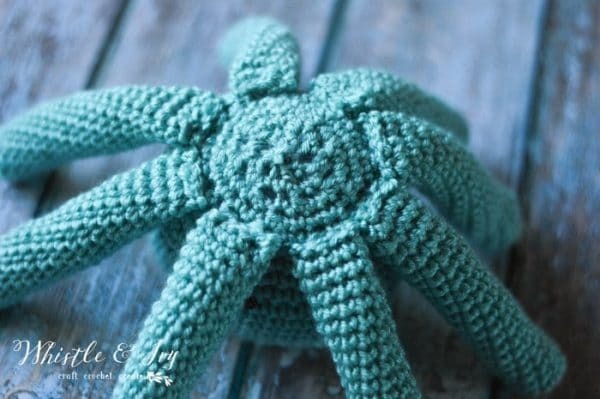 This crochet baby octopus will always be a reminder of how important our loved ones are and how impressive it is to keep our priorities in proper order. Please enjoy making it and hold your loved ones close! The past 2 weeks have changed me. If you are a newsletter subscriber or follow me on Instagram, you know my son was in a terrible accident on Labor Day. It seems like a year ago. Time is skewed and distorted. There have been a handful of times in my life when I felt scared for my own safety. Those feelings pale in comparison to the fear I felt for my son; I would willingly die if it secured safety for my son, without even blinking, without even thinking. 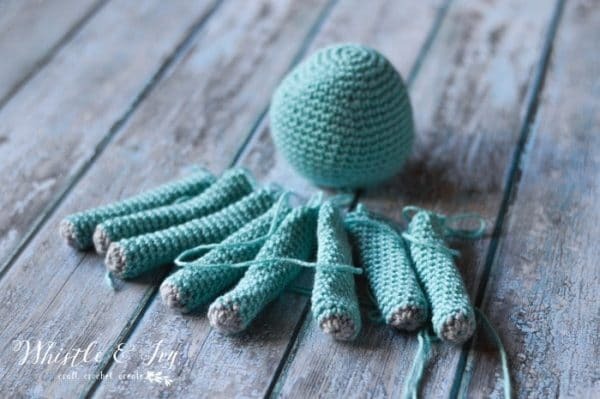 As I threw items into a bag for our hospital stay, I knew I needed my crochet. I needed to keep my mind out of very dark corners and scary, deep places. With agony and grief, I threw a project in my bag that I have been casually working on for a while, a project that my son had been asking for a few a months. 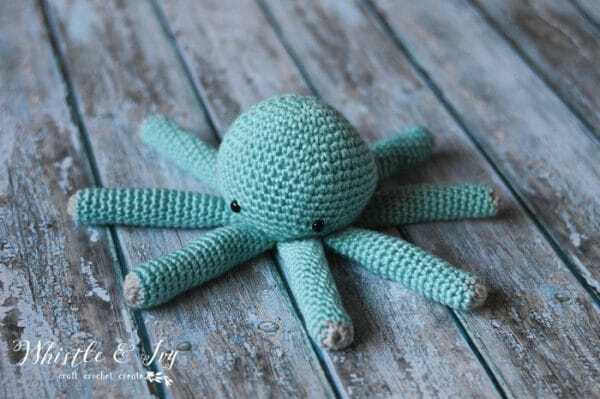 He really wanted a crochet baby octopus to go with his Plushy Octopus he named Octsock. Though I fully intended to finish it for him, it never seemed as important as other things that needed to be done. 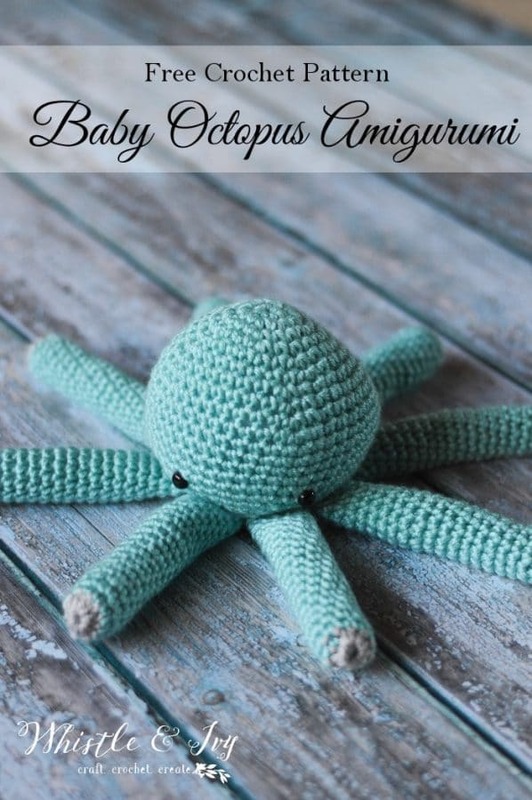 My heart broke as I thought about all the other things that came before this little crochet baby octopus, symbolizing all the things in my life that I was putting before my son. What I wouldn’t give to turn back time. Crediting the grace of God and prayers of hundreds (possibly thousands when I count your help), we watched our son heal in miraculous ways. Not only is he surviving, he is thriving. The doctors, nurses and therapists were stymied at how quickly he healed, at his strength, bravery and resilience. 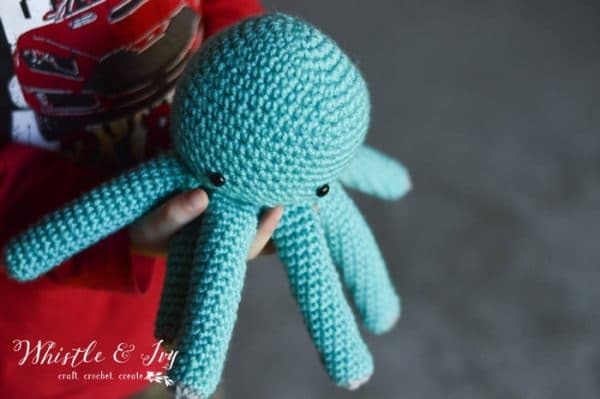 And while he lay unconscious for 3 days in the PICU, I worked hard to finished this little octopus, so I could maybe make up for not obliging my son’s simple and sweet request. Less than two weeks after the accident, he is standing, holding his new toy (the name is yet to be decided). 1. Ch 1 Sc 8 in the ring. (8 sts) Join with sl st.
2. Ch 1. 2 sc in each st. (16 sts) Join with sl st.
3. Ch 1. Ch 1. *Sc in next 3 sts. 2 sc in next st* work 4 times. (20 sts) Join with sl st.
4. Ch 1. *Sc in next 4 sts. 2 sc in next st* work 4 times. (24 sts) Join with sl st.
5. Ch 1. Sc in next 6 sts. 2 sc in next st* work 3 times. Sc in next 3 sts. (27 sts) Join with sl st.
6. Ch 1. Sc in next 7 sts. 2 sc in next st* work 3 times. Sc in next 3 sts. (30 sts) Join with sl st.
7. Ch 1. Sc in next 7 sts. 2 sc in next st* work 3 times. Sc in next 6 sts. (33 sts) Join with sl st.
8. Ch 1. Sc in next 8 sts. 2 sc in next st* work 3 times. Sc in next 6 sts. (36 sts) Join with sl st.
9. Ch 1. Sc in next 9 sts. 2 sc in next st* work 3 times. Sc in next 6 sts. (39 sts) Join with sl st.
10. Ch 1. Sc in next 10 sts. 2 sc in next st* work 3 times. Sc in next 6 sts. (42 sts) Join with sl st.
11. – 15. Ch 1. Sc in each st. Join with sl st. (42 sts) Join with sl st.
Place safety eyes between rows 15 and 16, about 9 sts apart. 16. Ch 1. *Sc in next 10 sts. Sc2tog* work 3 times. Sc in next 6 sts. (39 sts) Join with sl st.
17. Ch 1. *Sc in next 9 sts. Sc2tog* work 3 times. Sc in next 6 sts. (36 sts) Join with sl st.
18. Ch 1. *Sc in next 8 sts. Sc2tog* work 3 times. Sc in next 6 sts. (33 sts) Join with sl st.
19. Ch 2. *Sc in next 7 sts. Sc2tog* work 3 times. Sc in next 6 sts. (30 sts) Join with sl st.
20. Ch 1. *Sc in next 6 sts. Sc2tog* work 3 times. Sc in next 6 sts. (27 sts) Join with sl st. Begin stuffing. I like to keep it a bit loose until the very end so the stuffing fibers don’t get stuck in my stitches. 21. Ch 1. *Sc in next 4 sts. Sc2tog* work 4 times. Sc in next 3 sts. (23 sts) Join with sl st.
22. Ch 1. *Sc in next st. Sc2tog* work 7 times. Sc in next 2 sts. (16 sts) Join with sl st.
23. Ch 1. Sc2tog 8 times. (8 sts) Join with sl st.
Close the small remaining hole by sewing stitches across in a star pattern, pulling tight. Weave in ends to secure your sewing. Begin with 2nd color. Make a magic ring. Sl st into next st. Break yarn, leave a tail long enough so you can sew the legs in place. Thank you for your thoughts and prayers. My strong kid still has several more weeks of mending before he has made a full recovery. There is no greater news I can give than the fact that my precious baby is going to be fine. His injuries will heal. His mind is intact. And this experience has changed me. For the better. so glad to hear your son is recovering. 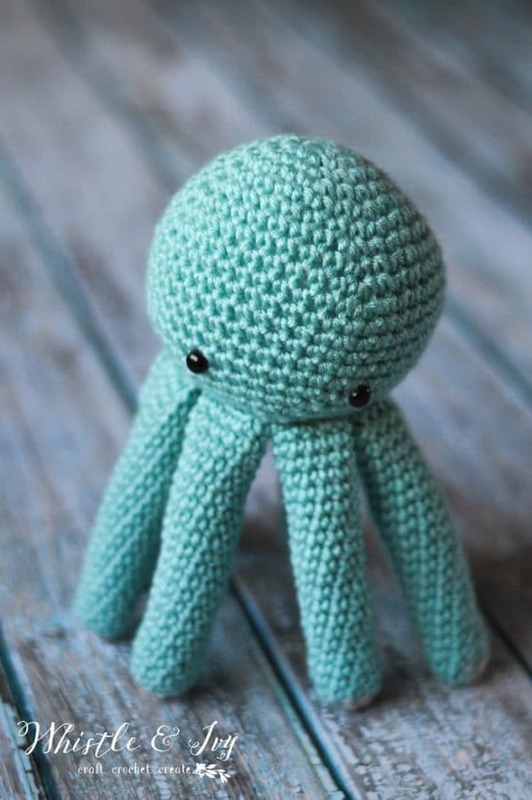 this octopus will always remind me of you and your son. thanks for sharing. I’m so glad you got your miracle. My husband is mine. He was shot while driving cab on May 15th, 2014. The Detective on his case started it as a homicide, because my hubby wasn’t expected to survive being shot in the side of his chest with a .44 from probably less than a foot away. He did survive & is fully recovered & the shooter is in State prison for 36-72 years. Thank God for miracles. Wow Ann. Thank you so much for sharing this. It’s life changing, isn’t it? We will never be the same (and that’s a good thing!). I am glad to hear that your husband is fully recovered. Blessings to you both! 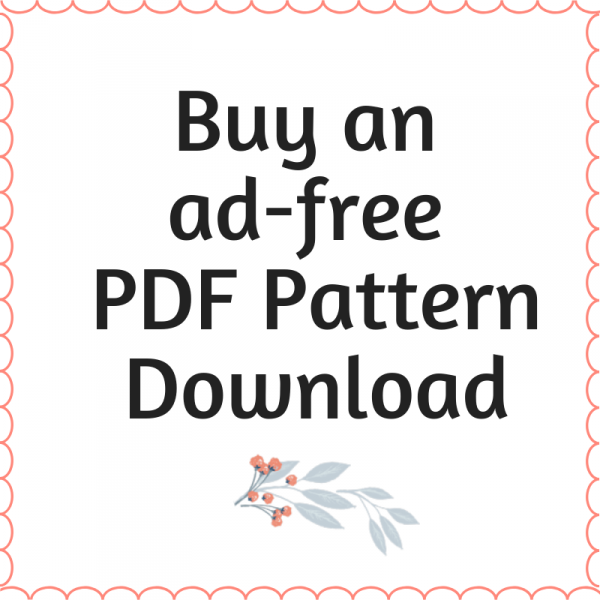 I love this pattern and I hope your son is doing alright <3 I am following the pattern but once I reach row 4 or so, my row isn't making it all the way around if I use the correct number of stitches. Any ideas? This is my first "in the round" so I'm sure there's a common mistake I'm making! Thank you! He is doing wonderful, he has completely healed and recovered! You might be getting confused on the increases. How many stitches do you have? And I hope you little one is much better now !! When I work it, the right side is on the outside already :) You can do which ever way you prefer though. I am so sorry to hear that your son & family have been through such scary times, but I’m glad to hearthings are easier this week! I hope he continues to mend and the memory soon fades. Just want to say I can’t imagine what you’re going through with your son having been in a serious accident. God bless you and your family and hope your sons recovery keeps improving. My heart aches for you. Nothing can impact of terrify us more than one of our dear ones in peril. And. . . It doesn’t stop when they grow up. It’s not the sheer panic of when they’re little, but it is still there. Praise God he survived and is a trooper. I can imagine! Being a mom is a lifetime commitment for sure :) I am luckily doing much better now that he is safely on the mend. Thank you for your kind words, they are appreciated very much. I was so happy to hear how well your son is healing! He sounds like a very resilient lad with a very supportive family…the perfect combination for getting well! You are all in my thoughts and prayers. Thank you!! We had the best of the best, and are incredibly blessed. Thank you for your loving support! So very glad to hear that your son is doing well. Praise the Lord! Oh Beth, praise the Lord for all his blessing upon your son, I am so happy to hear of his recovery and may he continue to gain strength to full health.